Every new cake trend highlights the vast amount of talent in this world. Thanks to social media, bakers everywhere are able to share their work and people like us are fortunate to enjoy the beauty they create and feel inspired to try something new. ENTER: the buttercream painted cake trend. Oh my gosh, have you guys seen these cakes on your Instagram feed? I’ve been swooning over them for so long now but I still can’t even wrap my head around skill involved. If only I could paint a fraction as well simply on canvas. Much like oil painting with a palette knife, these artists use cake as their canvas and buttercream as their paint. And the results are incredible! I know you’re going to love these cakes as much as I do. Here’s 10 Buttercream Painted Cakes! 1. Shades of burgundy and rust create dimension in this gorgeous floral cake by Sweet Bloom Cakes. And those strategically placed sprinkles are just too much! See more HERE. 2. This pansy covered design by Butter Blossoms is quite possibly the most beautiful sheet cake ever! Period. See more HERE. 3. Another incredible cake by Butter Blossoms but this time with sculpted roses. Can you believe those are buttercream? See more HERE. 4. Sweet Bloom Cakes uses soft blues, blush pink and sprinkles to create another stunning floral cake. And the background texture on this one really adds to the effect. See more HERE. 5. The 3D texture on this cake by Cynzcakes is beyond amazing. The soft colors and movement is like a dream. See more HERE. 6. The delicate blooms and blush hues are striking in this more literal floral design by SweetLeeMade. See more HERE. 7. Another fluffy floral design by Butter Blossoms. Obviously we’re digging her take on this trend. See more HERE. 8. What’s not to love about the captivating color scheme and small gold accents in this textured cake by Buttercream Bakery. The more you look the more color shades you’ll see. See more HERE. 9. With its rich color tones and movement, this one by Cynzcakes is worthy of a spot in your gallery wall. See more HERE. 10. The rich hues and sweeping strokes in this design Buttercream Bakery is mesmerizing. This cake is actually a three tier with even more detail to love. See more HERE. Are you feeling inspired and ready to give this trend a try? 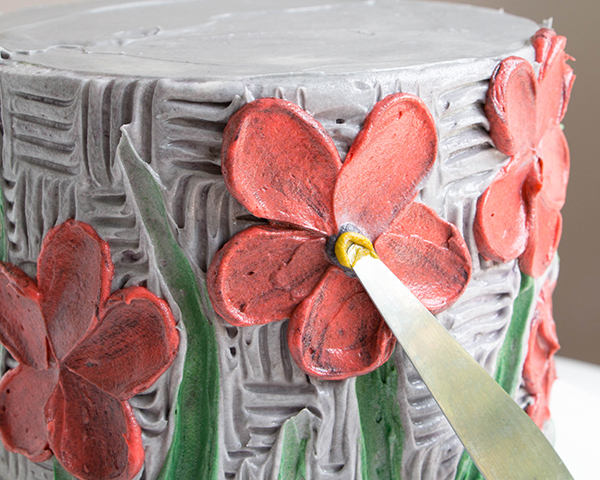 If so, check out our Buttercream Palette Knife Painted Cake. It’s a great tutorial for beginners! If you give this technique a go, be sure to share it with us on Instagram. Simply tag @thecakeblog or use #thecakeblog so we can see what you create. Enjoy!